We know that Galaxy S6 only supports MP4, H.264, WMV, etc. Therefore, if you wish to watch The 3D Blu-ray on Gear VR via Galaxy S6, you need to convert 3D Blu-ray to 3D MP4/MKV first for Gear VR. aPubsoft Blu-ray Ripper. It can transform The 3D Blu-ray to Galaxy S6 for Gear VR in 3D MP4/MKV formats easily for green hands. You are allowed to adjust 3D depth and A/V bitrate, resolution, display aspect ratio, etc in this process. Besides, 3D MP4/MKV, you are able to create video files that include more than one audio stream or extract subtitle to Kodi, Plex playback. Run aPubsoft Blu-ray Ripper as the best 3D Blu-ray to Gear VR Converter on your Windows PC (Mac version). Click the icon like a disc to load source movie from Blu-ray disc or a folder. It will automatically detect the main title to convert. Tip: From the “subtitle”, you can select your preferred subtitle or just tick “forced subtitle” after which you can’t freely choose your subtitle any more. Click “Profile” bar on the interface then navigate to “3D Video” category, and choose “MP4 Side-by-Side 3D Video (*.mp4)”, “MP4 Anaglyph 3D Video (*.mp4)” or “MP4 Top bottom 3D Video (*.mp4)” as the output format. 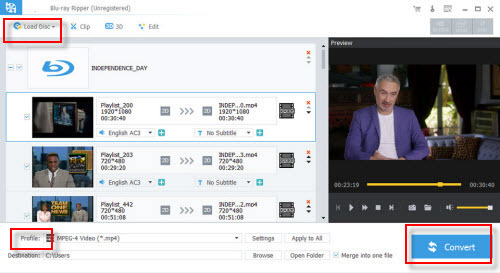 Tip: Click “Settings” and you can change the parameters like resolution, frame rate, encoder and bit rate for video, and sample rate, channel, encoder and bit rate for audio and save it as your own profile. 1920 x 1080 compressed side-by-side 3D should be resampled to 1920 x 540 resolution full side-by-side resolution. And keep audio in AAC or MP3. Click on the “Convert” button, it will rip 3D Blu-ray to 3D MP4/MKV for Gear VR playing immediately. 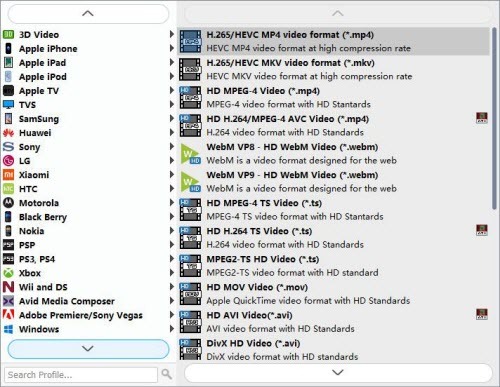 After the 3D Blu-ray movie ripped to 3D MP4/MKV, you can click “Open Folder” button to get the created 3D MP4 or 3D MKV files. Then, setup your Gear VR and put the generated SBS 3D MP4 video files in the “MyVideos’ folder miscroSD of VR Gear and start your theatric 3D experience at home!